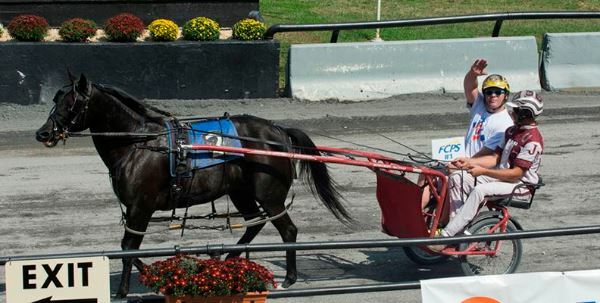 Deputy Superintendent Dr. Michael Markoe proudly carried the FCPS #1 sign throughout the Harness Race on Fair Day, Wednesday, September 19. Thousands of students attended field trips throughout Fair Week, and even more visited on Wednesday. See Superintendent Dr. Terry Alban's blog to discover the many ways The Great Frederick Fair provided outstanding opportunities for learning. Thank you to the many employees who worked to make the most of this annual event for our students. Valley ES Literacy Specialist Jill Barnes is determined to reach all students with a Mobile Literacy Clinic. She's written the only grant proposal in Maryland to make the cut in a national competition for $100,000. You can help! Extending our reach to students who can't get to summer and afterschool programs, the clinic will bring programs to them. Funds will also offer teachers a variety of texts and expand options to motivate more students to read. 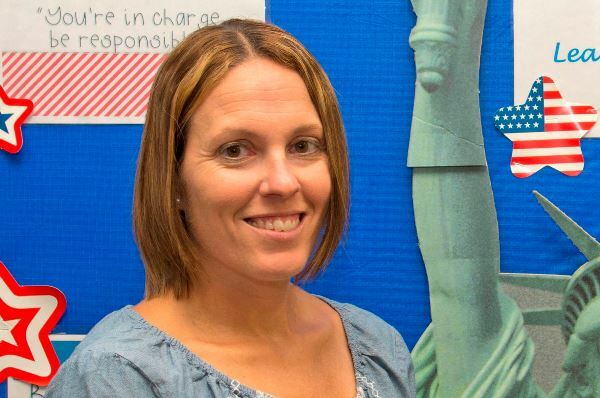 "Mrs. Barnes has persistence, passion and perseverance," says Principal Tracy Poquette. "I'm honored to work alongside her and always excited to support the opportunities she seeks!" *Please vote daily through October and spread the word throughout Maryland! See and share the news release. Congratulations to all staff earning FCPS All-Star Awards: Julie Aderhold, Gary Barkdoll, Becky Boughn, Julie Carter, Jane Duncan, Kaitlyn Fox, Kelsey Johnson, Orissa Landau, Marc Musser, Becky Schimel, Karen Sigismondi, Sarah Stine, Leah Stone and Christy Williams. SPORTSMANSHIP ICYMI: The spring season wrapped up with Gov. Thomas Johnson HS Patriots named the Central Maryland Conference Sportsmanship Award winners. 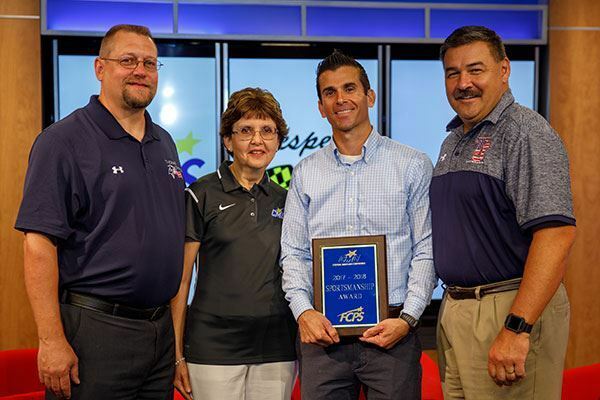 In the photo, left to right: Principal Dr. Dan Lippy, Superintendent Dr. Terry Alban, FCPS Athletics and Extracurricular Activities Supervisor Kevin Kendro and Athletic Director Mike Chavez. We also commend Principal's Cup winners: Oakdale HS Principal Donna Clabaugh with Athletic Director Chris Krivos (Gambrill Division) and Urbana HS (3rd consecutive win) Principal David Kehne with Athletic Director Ryan Hines (Spires Division). See photos. STATE CHAMPIONS In spring sports, Frederick HS's Robert Dixon coached students to the 2nd consecutive state championship win in 3A Girls Track & Field; Gov. Thomas Johnson HS's Billy Gross and Oakdale HS's Dave Lillard coached students to state chamionships in 3A Baseball and 2A Boys Track & Field, respectively. The following coached individuals to state championships: David Bly, Robert Dixon, CJ Ecalono, Bill Eckard, Chris Lewis, Dave Lillard, Paul Spurrier and Anne Zumbach. Achieving state championships in Unified Track & Field: Gov. Thomas Johnson HS in Division 1-3 with Coach Scott Rippeon, Tuscarora HS in Division 1-4 with Coach Trey Coates and Walkerville HS in Division 1-3 with Coach Will Scheets. 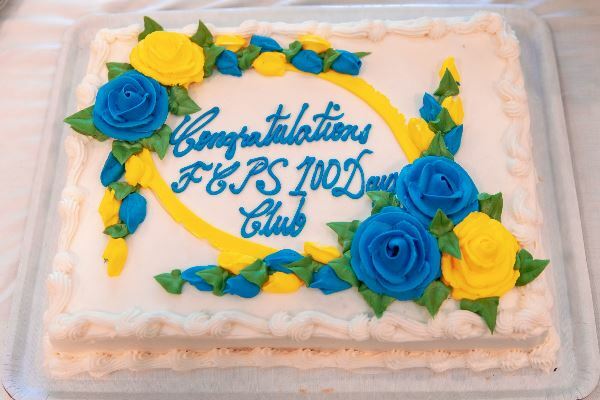 100 DAYS FCPS recently honored the 211 substitute teachers who worked 100 days or more in the last school year. See their names. 1ST IMPRESSIONS For the 6th year, FCPS issued Curb Appeal certificates to schools displaying the "best of the best" in keeping school exteriors in exceptional condition. Congratulations to the staff who did an amazing job and earned recognition at: Ballenger Creek MS, Middletown HS (4th consecutive year), Middletown MS, Monocacy MS, Sabillasville ES, West Frederick MS and Wolfsville ES (the only school that's earned the award every year since the program's inception in the 2013-2014 school year). See their names. MAIL Our couriers go to all county governmental offices, not just to FCPS. Please address interoffice courier envelopes beginning with “FCPS." Print the first and last name of the employee and the department name or location. Make sure the previous employee’s name and department are crossed out with a dark-colored marker. If you need courier envelopes, contact David.Stine@fcps.org. Outgoing U.S. postal mail must have a Mail Request Form. READY? September is Emergency Preparedness Month. See the FCPS School Emergency Preparedness flier and Frederick County Government emergency resources with recommendations for a basic supply kit. Also see https://www.ready.gov. FLU FCPS offers vaccines at schools and Central Office. See the schedule and wellness resources. BECAUSE YOU CARE Forms are coming soon about this year's Combined Charities Campaign. Your generosity will go a long way in helping those less fortunate in our community. WALKTOBER Registration is open for the 31-day Walktober challenge, which starts Monday, October 1. The first 100 people who register receive a fit health tracker. The team with the most steps earns NutriBullet Pros, the work site with the most participants earns fitness classes, and the individual with the most steps earns a FitBit Versa Smart Watch! 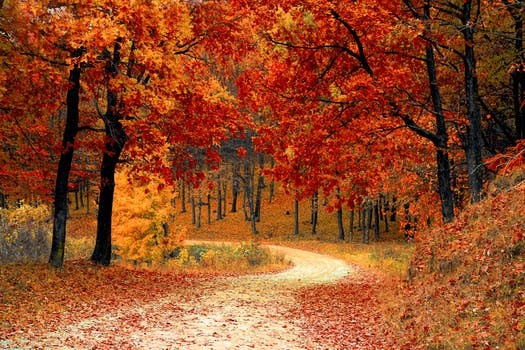 See more about this great way to incorporate walking as a wellness routine. LADIES NIGHT OUT Register and attend this Monday, October 8 breast cancer awareness event, which takes place 4:30-6:30 PM at FMH Crestwood, and you'll be entered into a drawing to win $100 in your paycheck. Mammography (from 12:30-5) requires an appointment, but other events are seated massage, speakers and more. just by showing your work ID! For example, on Monday, October 15*, you can enjoy our All-County High School Marching Band Festival, 6 PM at Middletown HS. See all 10 high school bands and the Shepherd University Ram Band! There is a fee for state-sponsored athletic playoffs.